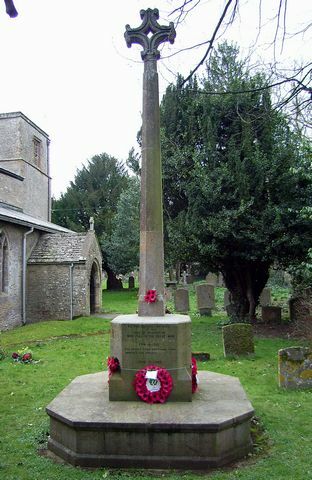 The War Memorial in the Churchyard of the Church of All Saints, Croughton. Germans were concentrating with terrible effect to save their burning ship, and there quickly followed another of the series of appalling catastrophes which so tragically distinguish this battle from all others. Four minutes after crossing the Lion's bows the Defence was hit by two heavy salvoes in quick succession, and the Admiral and his flagship disappeared in a roar of flame. He died from his wounds on 20 August 1918. He was 24. He is buried in grave V B 18 Daours Communal Cemetery Extension. He died from natural causes on 9 October 1919. He was 31. 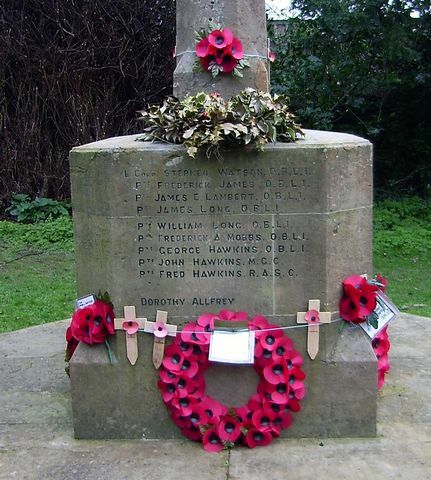 The memorial states the Berkshire Regiment. All the records show only service in The Oxfordshire and Buckinghamshire Light Infantry. 1st Garrison Battalion was posted to India in February 1916. Presumably he was hospitalised in Egypt as he returned home at a time when the Spanish Flu Pandemic was at its peak. He died on 23 April 1917 when the aircraft in which he was flying was shot down by an enemy aircraft. 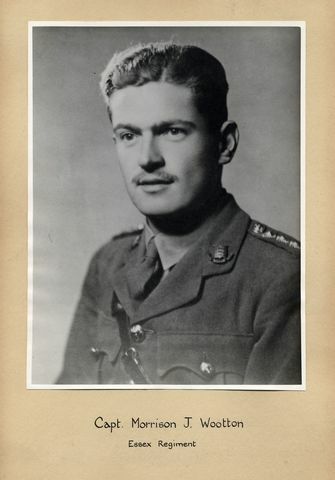 He was 31.
awarded the MC and for 2 years had held a Staff appointment with a Cavalry Brigade before volunteering as a Cavalry Observer with the RFC. 35 Squadron was equipped with Armstrong Whitworth FK8s and sent to France in January 1917 where they were attached to the Cavalry Corps, a fact commemorated in its badge. Reconnaissance was the squadron's primary role coupled with artillery co-operation, low-level bombing and gunnery. He was son of Alfred and Mary A Coles and the husband of Annie Waite (formerly Coles) of Brackley. Rouen was a major hospital centre throughout the war. Private, 13th (Service) Battalion, The Duke of Cambridge’s Own (Middlesex Regiment) 73 Brigade, 24 Division. Army no. He was killed in action on 1 November 1914 as the British Expeditionary Force made their stand before Ypres protecting the access to the Channel ports. He was 32. Sergeant, 16th Battalion Canadian Infantry (Canadian Scottish), 1st Canadian Division. Army no. 28699. He had earlier served 12 years with the Northamptonshire Regiment. Private, 700th MT Company, Army Service Corps. Army no. M/323118. He was formerly with The Worcestershire Regiment. Private 9th Battalion, Suffolk Regiment, 71 Brigade, 6th Division. Army no. 41944. He was formerly with the Northamptonshire Regiment. He died on 27 October 1918 of natural causes. He was 20. He died of natural causes on 12 March 1918. He was 43. He was the son of Mark and Ann James. Second Lieutenant, 11th Battalion, The Royal Fusiliers (City of London Regiment), 54 Brigade, 18 Division. He was the son of John and Ellen Leatherland, 3 George Road, Warley. He was killed in action during the fighting at Arleux during the Battle of Arras on 28 April 1917. 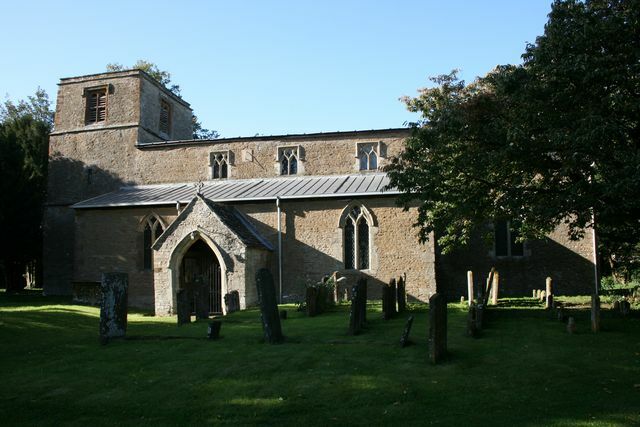 He was the son of Emily Busby (formerly Long) of Oddington, Islip, and the late William Long. He is buried in grave III C 4 Hamburg Cemetery. It is most probable that he was a Prisoner of War in Germany. This cemetery is the main burial place for British PoWs from WW1 who died in captivity. He died of malaria on 12 August 1916. He was 26.
he was born in Croughton. He died on 9 August 1916. He was 24. His Battalion was captured after the surrender of the garrison at Kut-el-Amara. 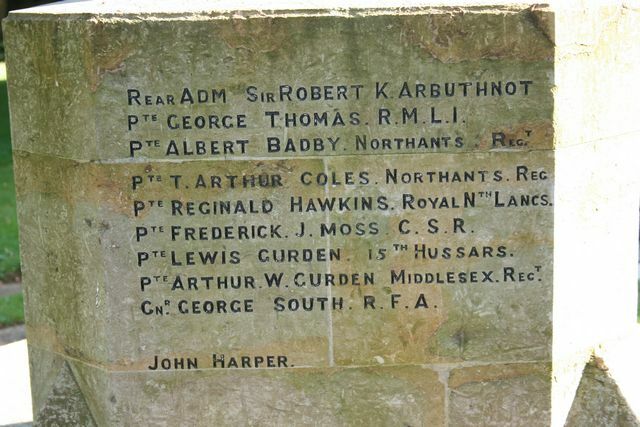 Whilst he was not killed in action, the cause of his death is not known but once again, the fevers that swept through the ranks of the British Army killed many soldiers. Indian Brigade, 6th Poona Division. 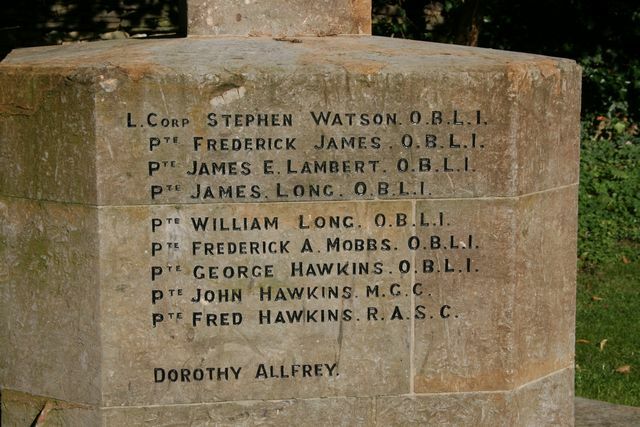 This Provisional Battalion was renamed 1st Battalion, The Oxfordshire and Buckinghamshire Light Infantry on 6 July 1916. Private, 15th (County of London Battalion) Prince of Wales's Own Civil Service Rifles, The London Regiment, 140 Brigade, 47th Division. Army no. 440. He died of his wounds on 17 October 1916 after the fighting at Transloy Ridges and the Butte de Warlencourt. He was 32. Midland) Casualty Clearing Stations in Dernacourt. He died in Toronto on 29 January 1917 from appendicitis. He was 42. His wife had returned to England before he was posted to Europe just before he died. She was living at Shaftesbury House, St. Mary's Row, Birmingham. He was killed in action on 19 September 1918. He was 38. Private, HMS Bulwark, Royal Marine Light Infantry. RN no. and fell back. There was a thick cloud of grey smoke and further explosions. When the smoke eventually cleared, the Bulwark had sunk without trace. She was killed by enemy action on 18 June 1944. She was 65. The Guards Chapel stood in Bird Cage Walk and was the Chapel of the Royal guardsmen based at the nearby Wellington Barracks. conducting the service, was totally unhurt. The altar where he was standing was covered by a portico which sheltered him from the blast. Legend has it that after the explosion the altar candles were still burning. It took 2 days to dig the dead and injured out of the devastation which was the worst V1 disaster. His aeroplane Halifax II, JD329, coded EY-G of 78 Squadron took off at 22.08 hours on 30 July 1943 from RAF Breighton to bomb Remscheid. The aeroplane was hit by flak then shot down by a night fighter. The Halifax crashed at Uedesheim on the west bank of the Rhine, 7 km from Neuss. 2 of the crew, Flight Officer G I Whitehouse and Flight Sergeant K A Skidmore RAAF were taken prisoner. Flight Sergeant Gerald A Rourke, RAAF Sergeant Ronald Shelton, Sergeant John F Harper, Sergeant David Williams and Sergeant Angus B Marshall. They were initially buried in Dusseldorf, then reinterred at Riechswald Forest War Cemetery. He was severely wounded in the action at the Trigno river on the night of 2 November and he died on 4 November 1943. He was 30.
battalion and unfortunately they sustained heavy casualties. He was the son of Annis A Smart (formerly Lambert) of Croughton and the late William J Lambert. the everyday threat and horror of trench warfare. Kut-el-Amara. Whilst he was not killed in action, the cause of his death is not known but once again, the fevers that swept through the ranks of the British Army killed many soldiers. We have not established whether he was a PoW but he was certainly in this theatre of war from 5 December 1914. 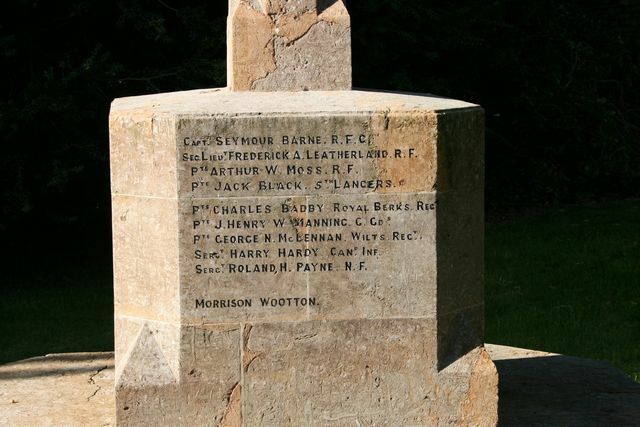 Provisional Battalion was renamed 1st Battalion, The Oxfordshire and Buckinghamshire Light Infantry on 6 July 1916. He died of his wounds at sea on 10 September 1915. He was 27. He is remembered on panel 158-170 of the Helles Memorial. He was killed in action on 10 June 1917 during the fighting at Messines. He was 32.